THat is a cheerful sign. Where is Penticton may I ask? Interesting…where is this town? Happy WW! What a lovely photo! I love the flowers .. 🙂 Happy WW! 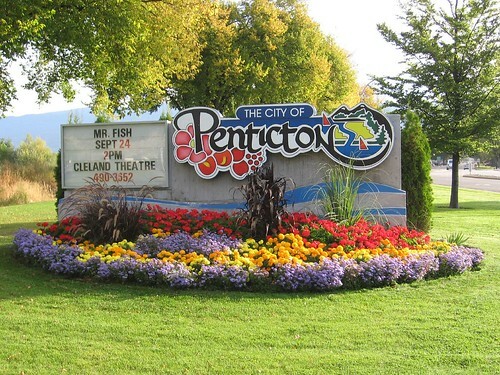 Penticton where? Looks like a friendly place! I’m still wondering about the Mr. Fish 🙂 Happy WW! My bet is that you (or your company) did the landscaping in front of the sign… Nice flowers! So, is Mr. Fish a dignitary? Im inviting all WWers and anyone else to join the scavenger hunt we started today on my blog. We are having a a great time and we have over 80 people playing!! and we have some cool prizes! It just started so there is plenty of time to sign up. Hope you will join us!!! Looks like a fun, colorful place! Great idea for WW this week ;). Happy WW! Beautiful photo must be a lovely place. Thanks for sharing. Copyright © 2008 -2010 All rights reserved.